With the Mexican revolt, which culminated in Mexico’s independence in 1821, the Spanish presence in North America came to an end. In 1824, the expansion of the Mission system was halted. 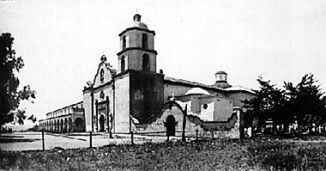 The missions were secularized in 1833, bringing an end to a critical chapter in California’s history (most of the missions were later returned to the Catholic Church). Over a short period – little more than 50 years – the Spanish brought a new culture to California, spreading European religion, agricultural practices, and eventually forms of government. Together, the missions performed over 87,000 baptisms, and 24,000 marriages. The mission communities kept over 150,000 cattle, and grew 150,000,000 pounds of wheat. Sadly, European diseases, carried by the settlers, killed thousands of California Indians. This, along with military victories of the Spanish over natives, established permanent dominance of European civilization. The settlements around the missions became the seeds of modern California’s major cities. The trail connecting the missions, El Camino Real, became California’s first “highway,” and its route is closely followed by modern Highway 101. In 1834, the government of Mexico ordered the secularization of the missions. The mission buildings and the surrounding lands were removed from control of the church and turned over to the Indians who had served the missions. Sadly, the Indians were ill prepared to deal with the complexity of modern society, and for the most part they quickly lost control of the lands to speculators and thieves. Although many of the missions were later returned to the Catholic Church, secularization brought an effective end to the age of the California missions. Today, all 21 of the mission sites can be visited, and most are still in use as churches. Unfortunately, almost all the missions are in serious need of repair. Some are in ruins, and several are close to collapse. A few have been restored or entirely rebuilt, and one is a California State historical park. Regardless of their state of repair, a visit to a California mission provides a fascinating look into California’s early history.